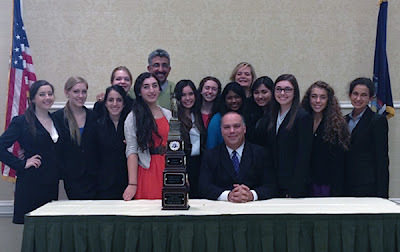 Late breaking--the La Reina Mock Trial Team captured the Empire World Mock Trial Championship title today in New York! The Regents are the only school to win two consecutive world titles--in 2011 and 2012. Thirty-six teams from the United States and six other countries participated in the tournament. In the preliminary rounds, the Regents won trials versus teams from Colorado, Pennsylvania, Georgia and South Carolina. The final match pitted them against Dos Pueblos High School from Goleta, California. The La Reina team knows Dos Pueblos well, most recently beating them for the California state title last March. Team members include seniors Elizabeth Hribal, Lena Melillo, Genesis Sandoval, and Rachel Warner; juniors Olivia Aulicino, Ryanne Bamieh, Camillah Hamideh and Nisha Srinivasa; sophomores Devin Montgomery, Edie Sussman and Alley Zlaket; and freshman Callie Buechsenschuetz. Coaches are Ron Bamieh, Gretchen Buechsenschuetz, Liz Harlarcher and Roxanne Torabian-Bashardoust, a 1995 La Reina alumna. Since 1990, La Reina's Mock Trial team has won the Ventura County championship 17 times. 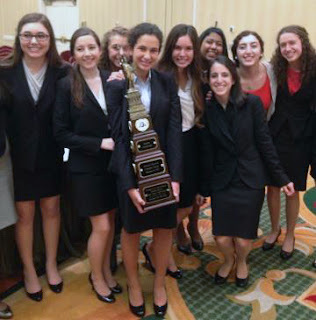 They also captured the California Mock Trial title in 2008, 2011 and 2012. The students are grateful to the faculty, coaches, parents, volunteers and donors who make this program possible. Follow this link for a feature article in the Ventura County Star.